I first read this story in 1976, in a book I’ve been unable to find since. But it’s my favorite Revolutionary War story. In honor of our nation’s birthday, let me tell it again. British commander Sir Henry Clinton and his troops occupied New York city. He wanted to take the Hudson River Valley north to the Canadian border, thus isolating New England and breaking the colonies in two. British forces under Burgoyne had tried moving south from Canada in 1777, but had been repulsed at the Battle of Saratoga. In his turn, Washington sought to drive the British from New York, from which he and his green militia had been routed in the fall of 1776. 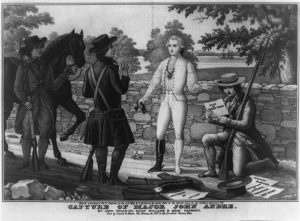 Now they were camped in Morristown, New Jersey, while he begged an impotent Congress for food, ammunition and clothing for his increasingly disheartened soldiers. The war, which had begun with such fanfare four years ago, had thus reached a grinding stalemate. Clinton and his adjutant-general, Major John Andre, hoped to break it by capturing the major American fort of West Point, on the Hudson river 50 miles north of New York. West Point’s commander was General Benedict Arnold, a hard-fighting, courageous battlefield commander who was responsible for the victory at Saratoga. Unfortunately, Arnold had been grievously wounded in that battle and side-lined, where he sulked over personal slights and lack of respect given him by Congress. As such, Arnold was ripe for “turning his coat.” Arnold’s wife, Peggy Shippen, from an old Philadelphia Tory family, with her good friend (and possible paramour), Andre, sought to do just that. Arnold finally agreed to surrender West Point to the British for 20,000 pounds and a rank in the British Army. But he wanted to meet Andre in person. The meeting was set for the woods 15 miles below West Point on the night of September 20. At the very same moment, Washington was returning from a trip to Hartford, Connecticut where he’d met with the French commander, Admiral Rochambeau, to plan a joint assault on New York. He’d told Arnold he would stop for a visit and an inspection of the fort on his way back. Andre came up the river on a British sloop, in uniform, planning to return to it right after the meeting. However, morning came before they were done. American troops across the river began firing on the sloop, forcing it to go downriver without Andre. Now he had to travel south through Westchester County–where I grew up—at that time, a no-mans’ land haunted by partisans, outlaws and guerillas of both sides. Arnold wrote him a pass and persuaded him to change into civilian clothes for the dangerous journey. But Andre refused to take off his beautiful (and expensive) officers’ boots which had been given him by his mother when he joined the army. Instead, he tucked the plans for West Point into the boots and set off. Near Tarrytown, he was stopped by three American guerillas called “skinners.” Looking for money and valuables, they forced him to strip. Then their greedy eyes fell on his boots. When they pulled them off, the plans came out. Though only one of them could read, they became suspicious and took Andre to a nearby army post. After some to-ing and fro-ing, Andre admitted his identity. Shortly before Washington was to arrive at his house, Arnold discovered that fact and fled, leaving Peggy and their children behind. Though he became a British brigadier general and fought in Virginia, he never received the honor and glory he sought. Peggy feigned madness and innocence to escape retribution and was sent back to her family in Philadelphia. Andre was hanged as a spy in Tarrytown. News of Arnold’s betrayal brought indignation throughout the colonies and rededication to the war effort. General Cornwallis and his troops surrendered at Yorktown, Virginia, two years later. The war was officially over in 1783. But none of this would have happened had Andre not kept his boots. On such tiny pins do the hinges of history turn. Coincidence or the hand of God? I know what I think.